The injury bug strikes again. 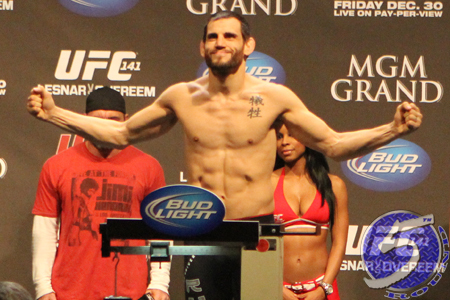 Jon Fitch (Pictured) has been forced out of his July 11th scrap against Aaron Simpson courtesy of a partially torn ACL in his knee. Fitch was looking to bounce back from only the second loss of his UFC career. The former welterweight top contender was put to sleep by Johny Hendricks at UFC 141 this past December. Simpson has spent the majority of his professional time fighting at middleweight. Although he owns a respectable 11-3 record, the 37-year-old decided it was time for a change of scenery following a close split decision defeat to Ronny Markes in February. Simpson is expected to remain in the “UFC on FUEL TV: Munoz vs. Weidman” lineup, as the organization is scouring its 170-pound roster to locate a suitable substitute. FUEL TV will broadcast the featured bouts live beginning at 8PM ET/5PM PT. Fitch and Simpson were slated to appear in the main card.